Test your knowledge of the ICC Model Building Codes by answering the following. If you cannot easily answer 80% of the questions, you should purchase and read ICC400 Standard on the Design and Construction of Log Structures. The standard is available in hard copy or electronic (pdf) format through the International Codes Council (www.iccsafe.org). Which of the following are mandatory requirements found in ICC400? How many components of settling may determine settling allowance? True or False: Green logs are certified for moisture content by a grading agency. True or False: Log wall thermal properties are defined by their nominal thickness. True or False: There are no limits on notching in wall-logs. What is the difference between a sill log and a bottom plate log? Can a log wall have an unsupported height greater than 20 feet without being engineered. True or False: ICC400 was written for handcrafted wall systems only. Does ICC400 or the Int’l. Energy Conservation Code recognize solid wood walls as a mass wall technology? If a log wall system is not designed to settle, is it permitted under ICC400? THERMAL: ICC400-2012 Section 305 Thermal Envelope presents requirements for weather protection and determination of thermal properties, offering prescriptive, calculation, and performance options. 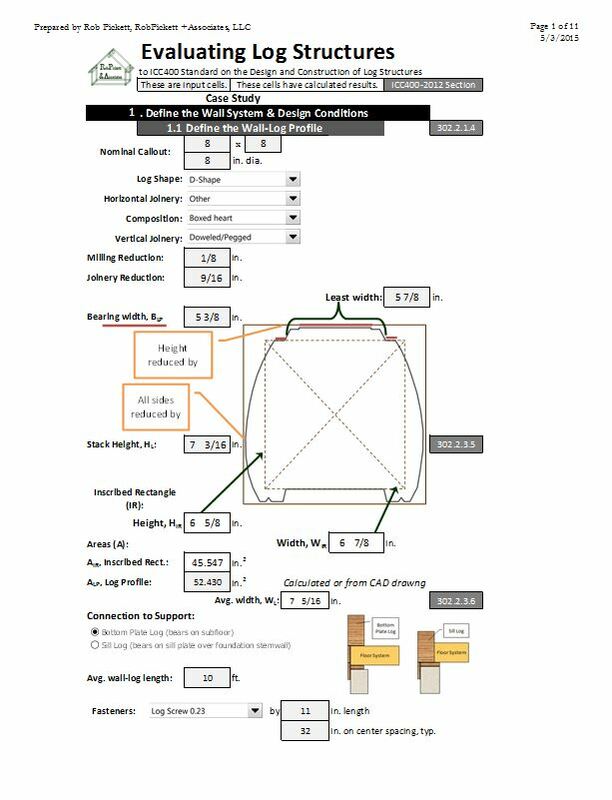 TABLE 305.3.1.2 Insulation and Fenestration Requirements by Component provides one such prescriptive option. This table was created during and following the early code development discussions of the 2012 IECC. AIR INFILTRATION: Guidance is provided in ICC400 in Section 306 Infiltration. Section 306, along with 305.1 Weather protection and 304 Provisions for Settling in Log Structures all work in unison to address the issue. The same blower door requirement of the 2015 code shall apply to log walls as for any other method of construction. VAPOR RETARDERS: As noted in Exception 3 of IRC Section R702.7 Vapor retarders, “Construction where moisture or its freezing will not damage the materials.” There is no cavity to protect in a log wall, and all joinery is covered by ICC400-2012. EXTERIOR COVERING: The Exception in IRC Section R703.1 General refers to “Log walls designed and constructed in accordance with the provisions of ICC400.” The standard covers all discussion of weather resistance, drainage planes, etc. It is important to note that ICC400 pertains to building solid wood walls and structural framing with logs. It defaults to the I-Codes for design conditions, foundations, roofing, mechanical, electrical, plumbing, etc. In Section 305 Thermal Envelope, ICC400 calls for compliance with the requirements of the IECC with an exception for log walls. The thermal properties of log walls can be taken from prescriptive tables, tested or calculated per the stipulated equations. Application of thermal mass is described to establish conformance with the IECC. The ICC400 Evaluation worksheet is an integral part of Rob’s seminar on Evaluating Log Structures. The seminar includes the worksheets as a training tool, but the Excel spreadsheet can also be used independently to evaluate the log/log wall. This report is not as extensive as the TimberLogic Log Wall Performance Estimator. For example, it does not include any span tables to compare to log framing plans. However, all aspects of ICC400 are addressed in this one document. Printed to an Acrobat PDF file format, it is ready for assimilation into plans, permit submission packages, and reviewing by engineers.